1. one of your favorite poets? 2. one of your favorite poetry books? 3. one of your favorite lines from a poem? How about you? Would you consider Wordling, using some kind of poetic grist? What would you use? If you decide to try it out, post your Wordle on your blog, with an explanation of what kinds of material you used to create it. 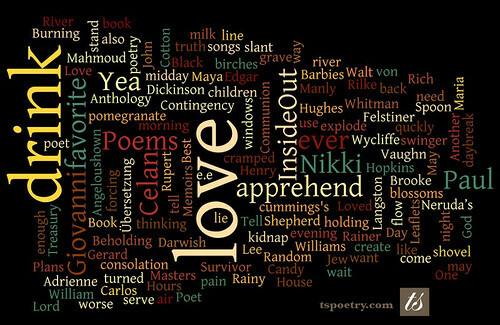 Then share your Wordle with us by next Wednesday, May 18th, for definite links and possible feature here at Tweetspeak Poetry. Just drop your link on the T. S. Wall. Visit L.L. Barkat at Seedlings in Stone, for more on writing, poetry, art and life.